My Kids First 5k – The Color Run! My youngest son has been toying with the idea of running for a while, probably since he started middle school last year. He runs on the track in gym and periodically he just gets the bug and wants to run with me. Although this urge to run keeps coming back it never lasts long, and that’s partly my fault for not encouraging him as much as I should. Last year I told the kids we’d probably do The Color Run but it was in December and with the holidays and all we just never did it. This year? 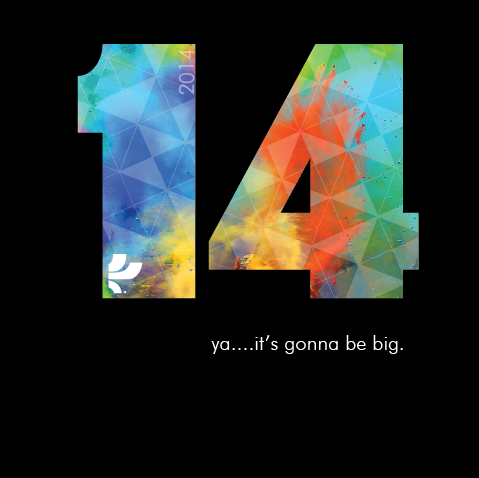 This year The Color Run is going to hit Clearwater January 26th, totally do-able! Even my (also middle school) daughter who has little if any interest in running is excited about running this one. I’m going to do my best to convince them both that they want to start the Couch to 5K soon to get ready for it. But if they don’t it doesn’t matter a bit, this run is all about having fun. Which of course is the best reason to do anything. I can get behind that! Except for I don’t actually own anything white due to spaghetti sauce and salsa, so I’ll have to rectify that. Do you want in? Um, they say it’s the happiest 5K on the planet, of course you do! On top of all the fun you also get t-shirt, headband, tattoo, and a color packet when you go to pick up your race bib.You can use the code Color5Off for a $5 discount to sign up for a run in any city and if you sign up as part of a team of 4 or more you get an additional $5 off per person. Sweet! Just don’t forget to use the code when you register, they won’t apply it after the fact. Another cool thing is kids 5 and under get to participate for free! Of course they don’t get the swag but who cares? If they need the t-shirt you can get them one here! I have a 4 year old nephew who’s favorite thing in the world (besides fighting monsters of course) is racing people around the neighborhood. I am hoping he can come with me, he’d have a blast! Just don’t forget that 5k = 3.1 miles so if you bring a wee one be prepared to get an extra arm workout if you need to do some carrying! 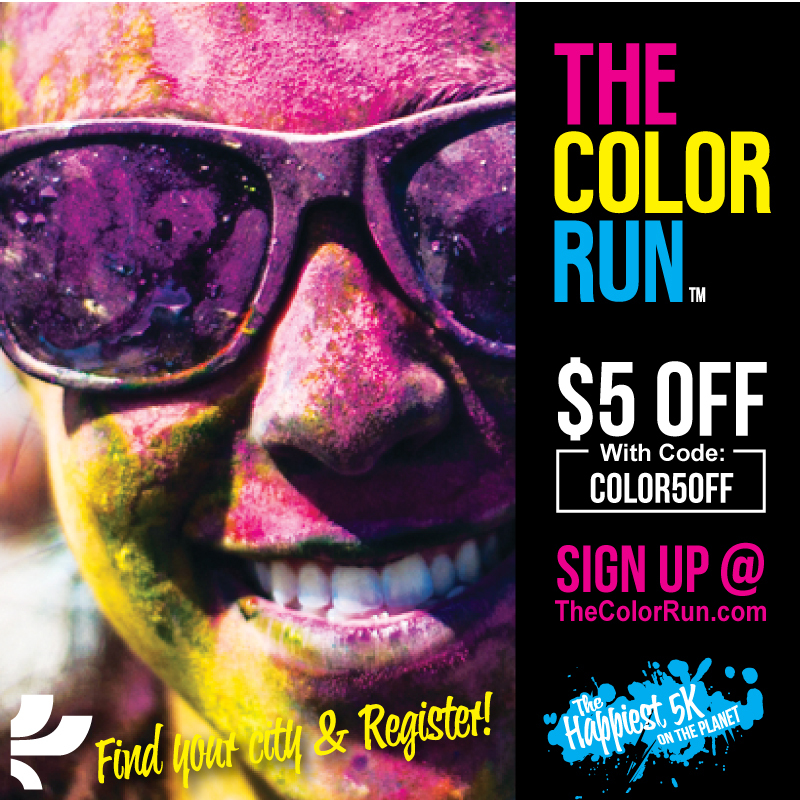 You can check out The Color Run’s site for more information and to sign up. Disclosure: I have received two free race entries in exchange for posting about The Color Run. 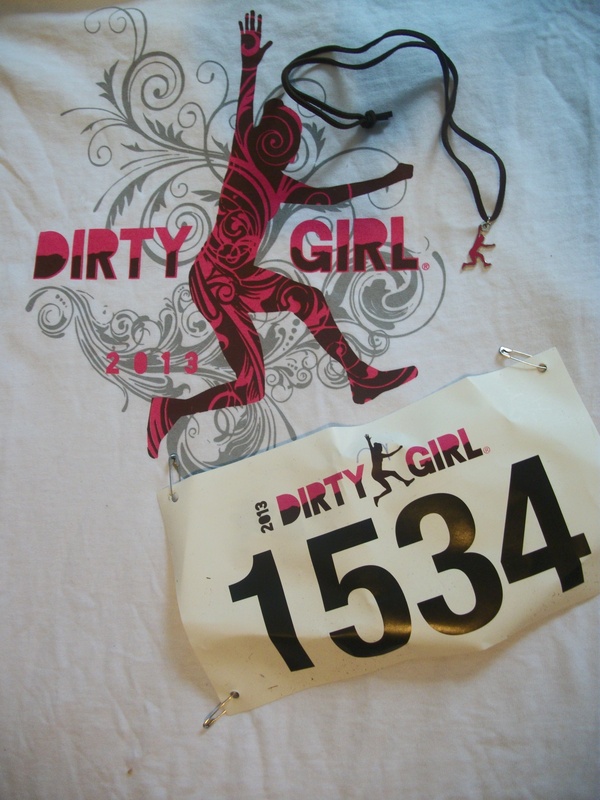 I ran the Dirty Girl mud run in Tampa Saturday at 8am. That meant I had to be somewhere an hour from my house around 7am, translate to I had to get up really early on a weekend and it was my own idea. Geez, sometimes even I wonder about me. I don’t think I’ve ever signed up for a run before 10 am because well, it would be before 10am. But check out the payoff. 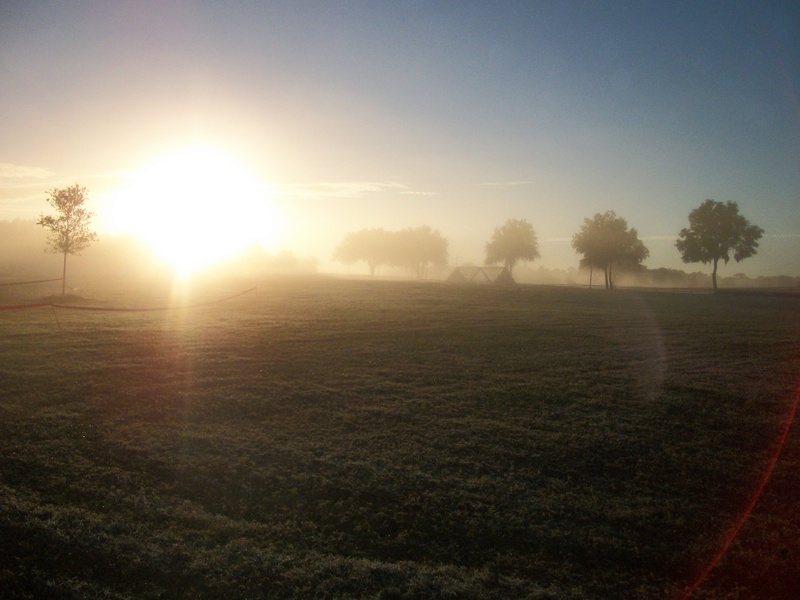 It was beautiful and foggy when we got there. 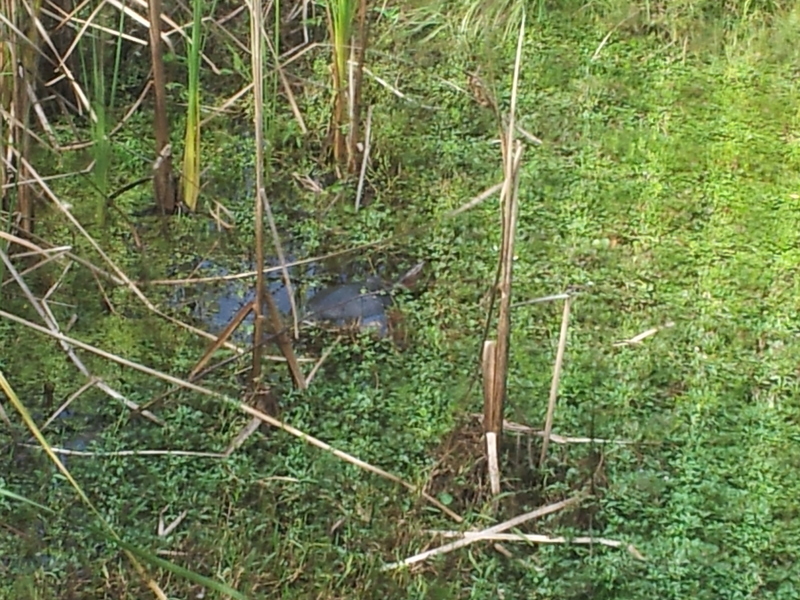 Sadly the fog lifted quickly but Little Everglades Ranch is always beautiful. It seems that Tampa is a saner place than it’s reputation, the early run wasn’t very crowded. Even if it had been it wouldn’t have mattered because they had the sign in process and everything set up really well. This is the first mud run I’ve ever done where I didn’t have to wait to spray the mud off AND there was actually enough water pressure to rinse off. Nice! I had originally planned on running this one by myself but I ended up running with a couple of fellow Tampa Bay Bloggers members. This isn’t one of those races where the obstacles are so difficult you need to run with a team so everyone can help each other, but I had way more fun than I would have running by myself! 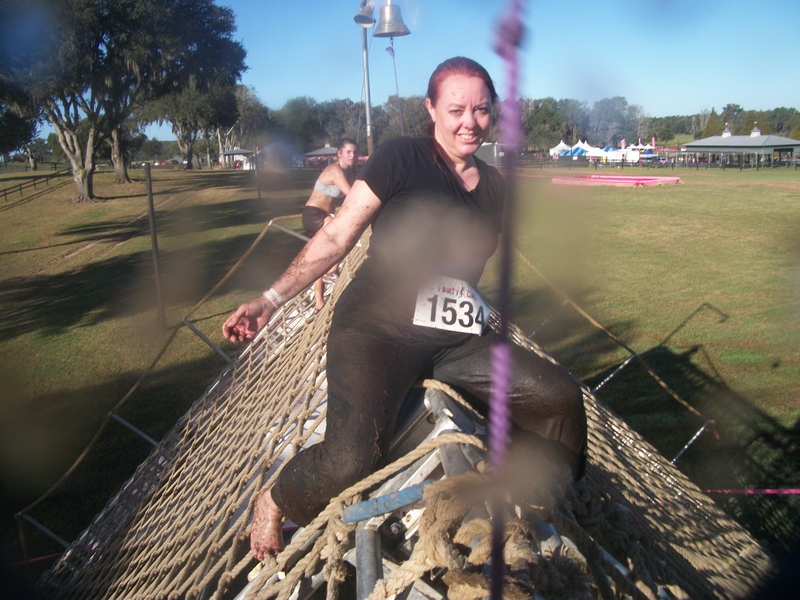 I was excited about this race because it is the first obstacle run I’ve done barefoot. I stashed some running shoes in my backpack in case it wasn’t allowed but the few comments I got were all positive. I knew Little Everglades Ranch would be a good place to try it though the run did start with a gravel road, I ran beside it in the grass. 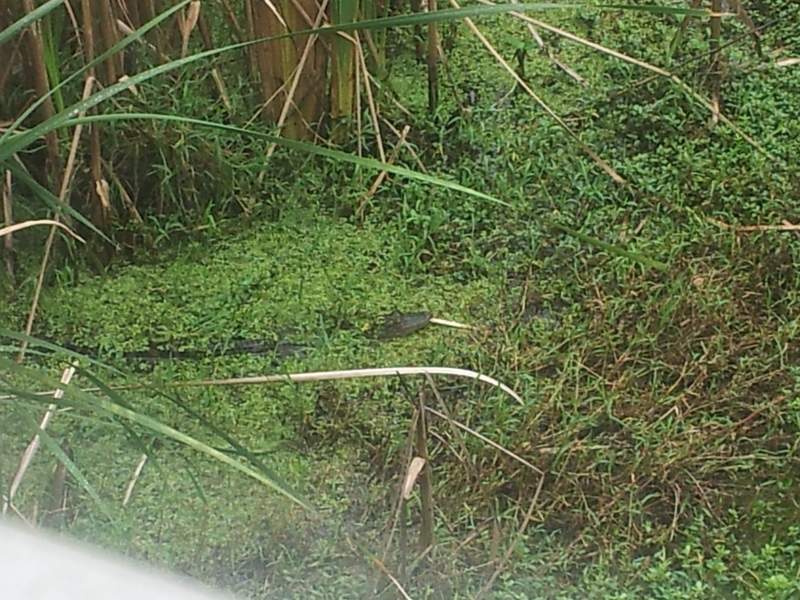 Also, this pond is full of pointy rocks on the bottom, that was fun. The only part I was really worried about was the rope net – I was afraid it would hurt and it did. Of course I had to pause for a picture at the top just to prove that I had actually done it. I realized I’m starting to like the walls that you can climb (without a rope), I think because going over the top used to be so scary and now it doesn’t bother me. Any and all progress makes me happy! Oh, and yes it seems there was a bit of muddy water on my camera lens and also the waterproof camera bag I had it in slipped to the side so several of my pics had a lovely black ring on one side or the other. Someday I’ll have to invest in an actual waterproof camera, but today is not that day. A fun thing about these mud runs that aren’t crazy hard is you seem to get much, much muddier. There was a mud pit where you had to crawl under a net to get through, there was just no other way and also some long tubes to crawl through full of nice, dark coffee colored water to go through. 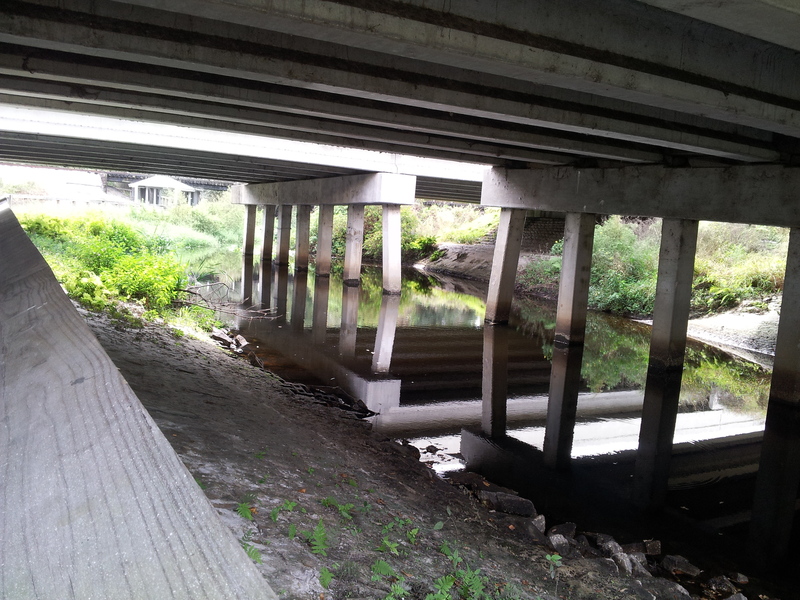 I can’t pretend I wasn’t thinking of water moccasins crawling through there. 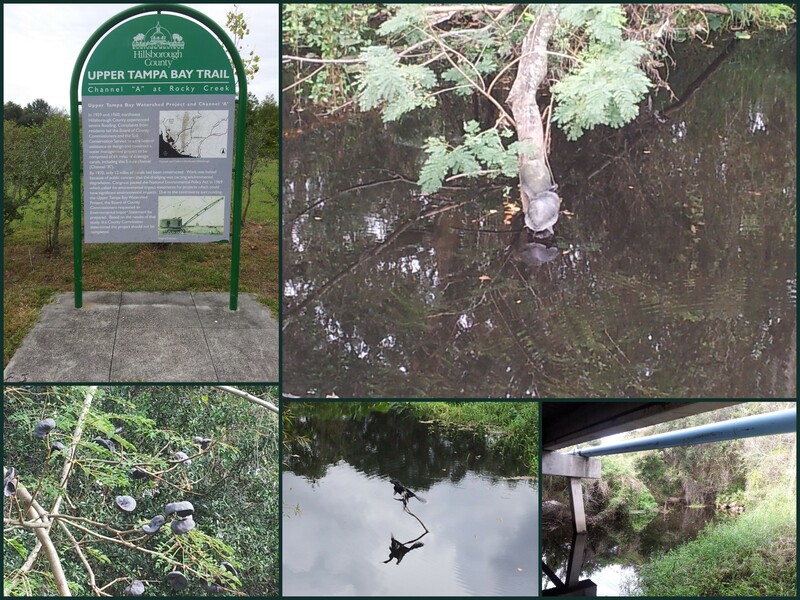 You can’t tell in the pictures because I was wearing black but my clothes were soaked in thick muddy water. It required quite a bit of scrubbing to get clean afterwards! 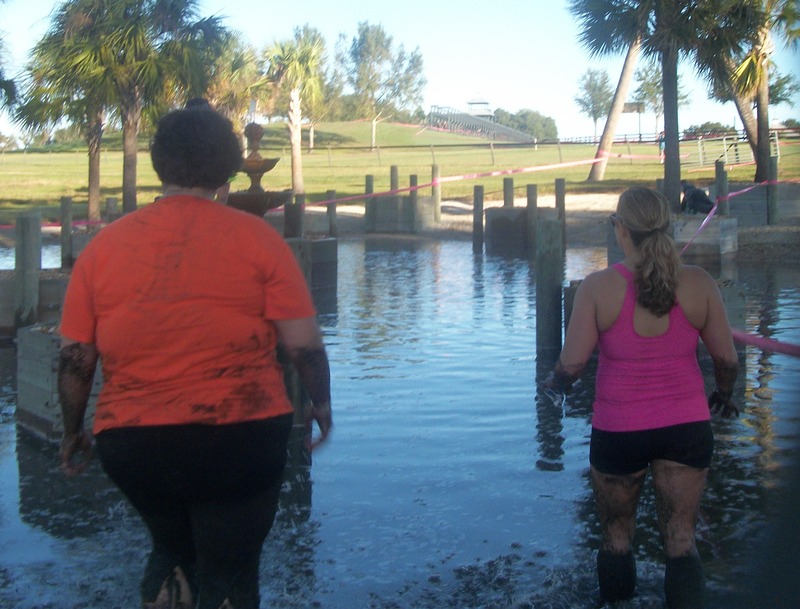 There IS a reason they call it the Dirty Girl mud run. I can’t think of anything I didn’t like about this run. The parking was close, the organization was stellar and the run itself was a lot of fun. 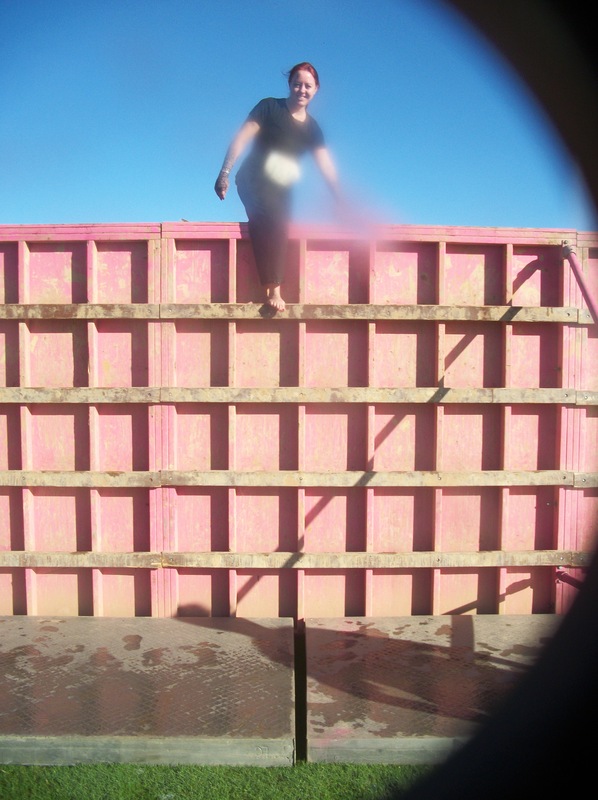 I would have liked more obstacles but I think that about every run, I love the obstacles! There was even the mandatory complimentary ice cold beer afterwards (yes, I know it wasn’t even 10 am yet. don’t judge). I was a little bummed they gave out necklaces instead of the usual medal, but this is a lot more wearable and it IS a women’s run so it fits. And on that note, my also mandatory showing off of the bling. After the run I did a couple errands and then headed out to Riverview to visit some friends. They took us to Sakura for saki and sushi. I like sushi OK but there are usually maybe 2 vegetarian choices so it’s not my favorite. I had the AAC roll (asparagus, avocado and cucumber) which was the same ingredients as usual but honestly better than I’d had before and also sweet potato rolls. These were outstanding! I also had a seafood salad that was pretty good, it was oddly florescent though which made me wonder why. I also tried saki for the first time. I can’t say it was my favorite. It wasn’t horrible or wonderful, it just was. I know there are lots of different kinds so I’ll have to try it again. All in all a pretty great day; Sunday I did as little as possible and enjoyed that as well! 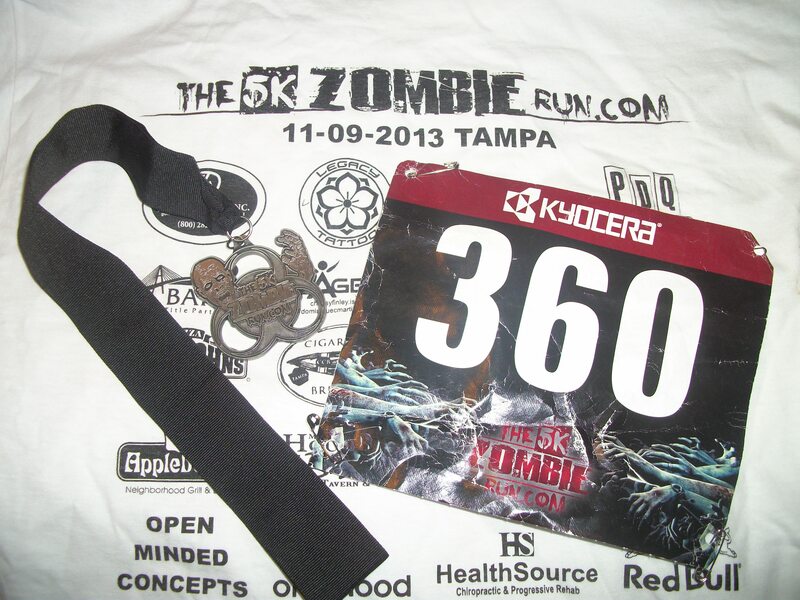 The 5k Zombie Run – Why Can’t I do this Every Weekend??!? This race was pretty simple. No obstacles. No timers. No roads. 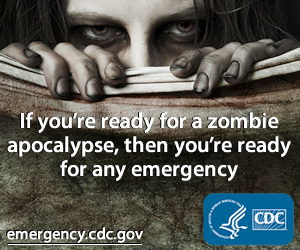 No way out without getting dangerously close to many, many zombies…. Nothing like sprinting through a small zombie horde to get your heart racing! 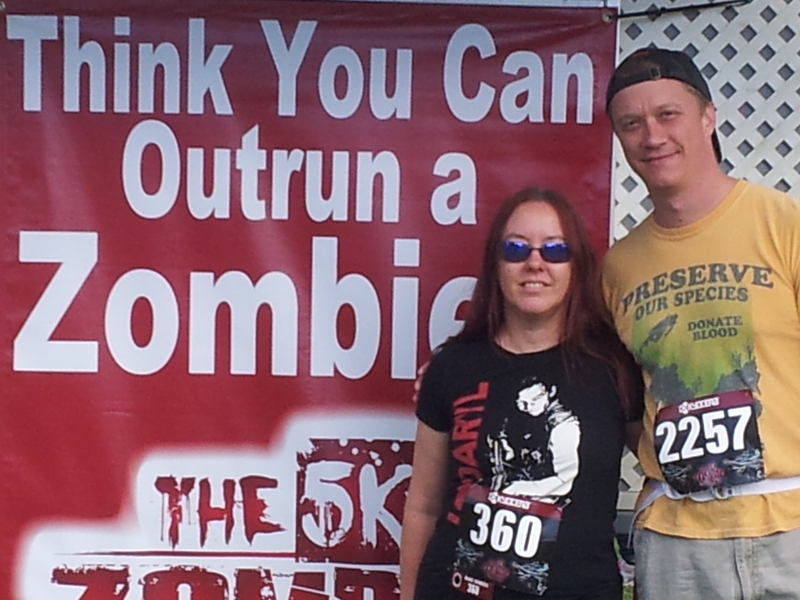 I think I ran faster during this un-timed run than ever before – thank goodness we were able to walk between the zombies. That’s the biggest part of the fun of these runs, trying to dodge between zombies chasing you, zig-zagging back and forth at top speed. It’s not everyday an adult can get away with that you know. The other half of the fun is everyone there is obviously having a blast and really, really nice. This is the second time I’ve run this and both times every single person I met was super friendly. I started wondering if I could get my kids to dress like zombies and get them to jump out randomly on my regular scheduled runs. 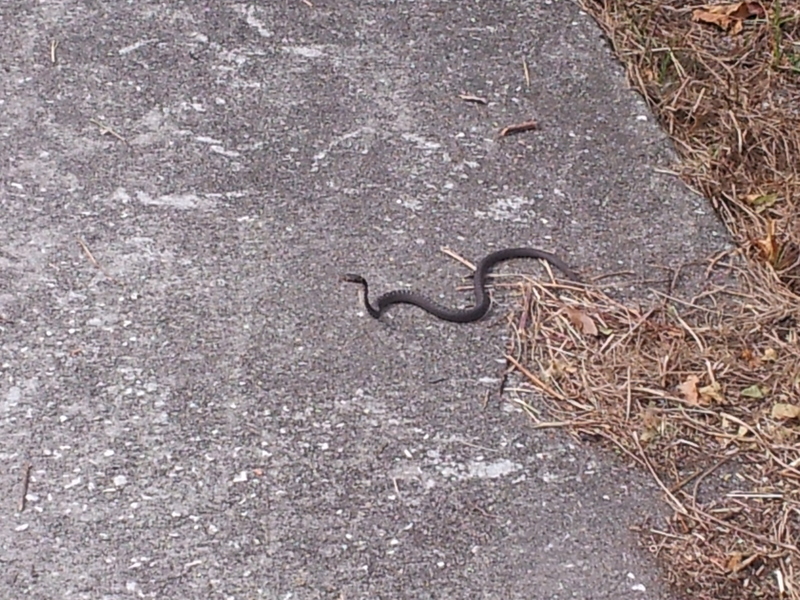 Would my neighbors come running out to help? There were a lot more zombies this year than last year. 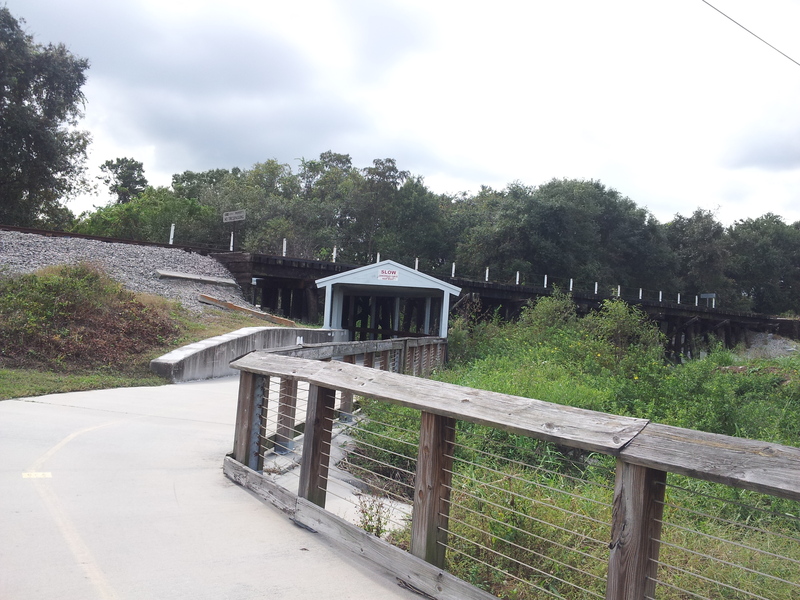 The run was at Lake Park in Lutz, Florida which is like 30 minutes from my house and I’ve never even heard of it before. I’ll definitely be visiting here again! I’d even swear I saw a lake through the trees at one point, I must go back exploring. The bad thing about a trail run with zombies? Well, a trail isn’t exactly a road. If a zombie comes running up behind you (some were original Dawn of the the Dead slow and some were new Dawn of the Dead fast) you can’t exactly get through the crowd in front of you. It’s kind of like my driving mantra. You can’t go faster than whoever is in front of you, try as you might (stupid tailgaters). However, in a moment of zombie induced panic I did try and get past the guy in front of me for a minute, then I had to stop and apologize. He didn’t care a bit but I felt a wee bit dumb. 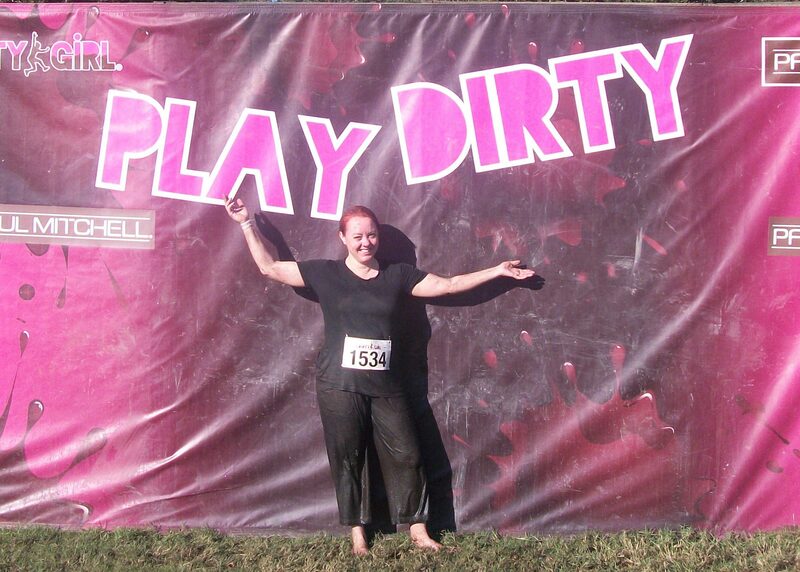 There was no mud and not too much blood so no need for an after picture, but here we are before the run. Heck ya I was proud of my I ♥ Daryl t-shirt. Speaking of blood, they had a blood splatter station for the zombies. Dexter would have been so happy. One other thing of note – this is the second time in a row I started a run with shoes and ended without them. I wore the same shoes I always do to an organized run but this time they tore up the backs of my feet from the heels all the way to the top of my shoes. Maybe because this wasn’t a mud run and my feet were dry? I have no idea but I think I may be officially done with running in shoes, obstacles or not. I’ll spare you the gory pictures (you’re welcome) but trust me when I say it was quite the lesson learned. And contrary to what I would have thought only one single person even seemed to notice the lack of shoes, and she just asked if I was a barefoot runner. What else could there possibly be to add to the good times? Superman Walks founder Thomas Mills was there. If you haven’t heard of Superman Walks you should check out their site, it’s a great organization. I’d love to walk with them one of these times. And of course you can’t forget the racing bling. 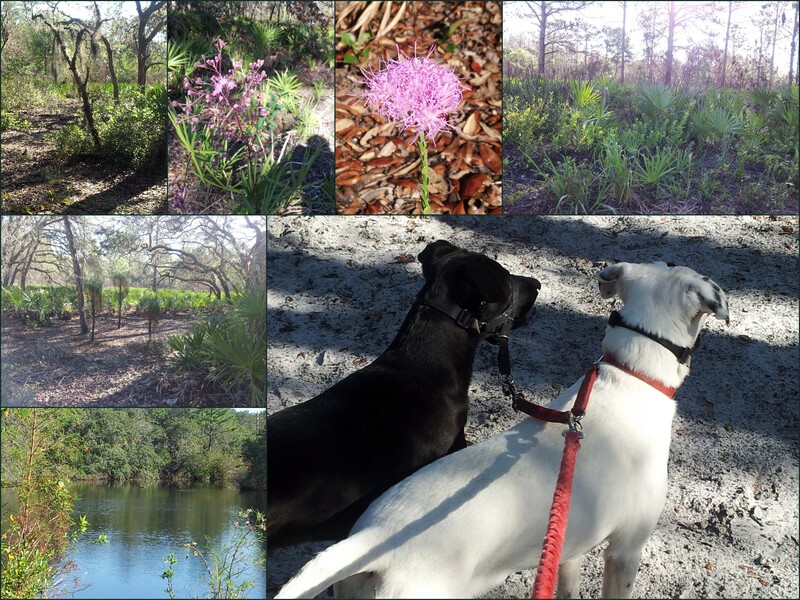 I took the dogs for a walk over at Starkey this morning, the weather could not be better today. The mutts had such an exciting time they were more riled up for a while after the walk than before it – talk about a back fire. But they are mellowed out now, yay 5 minutes of peace! 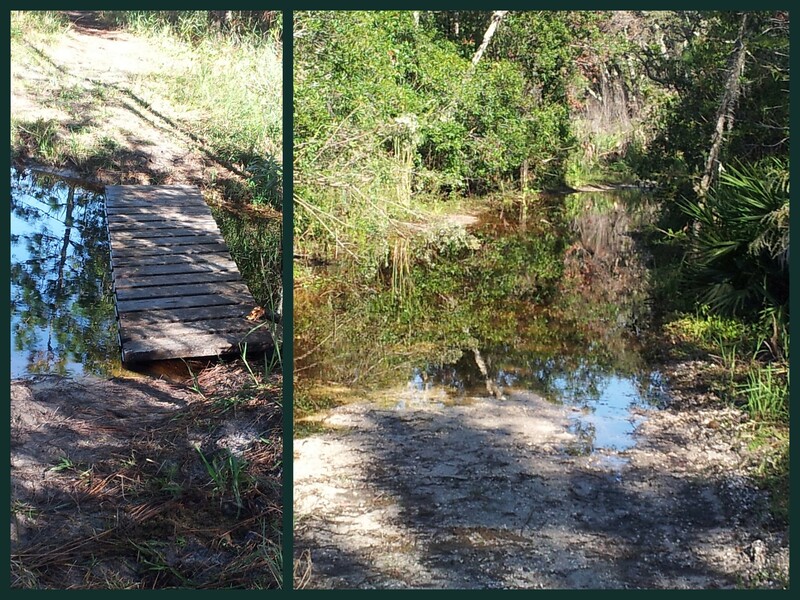 For the first time in memory we were able to get over the little walking bridge, lately it’s always washed sideways. That gave us two options, the road or the bridge. I chose neither since the dogs have to walk in tandem, but they headed over the bridge without a problem. Yes, the picture on the right is the road! The mutts were happy because we passed about 10 other dogs and a couple of horses. Not to mention the fact that we heard something big right off the path in the bushes (maybe a squirrel, maybe a mountain lion, who can say?). If that wasn’t enough while we were walking on the narrow path back a bird ran right under their noses from one side of the path to the other flapping it’s wings and squawking like crazy. I’m pretty certain the dogs thought it was the BEST walk ever. I had fun too, if they care. Florida can definitely have a zen like beauty! Last month I decided that since it was my birthday on the 1st it would be the perfect time to start creating monthly goals. Kind of like mini-New Years resolutions except that I never make resolutions. So not SO much like that. Anyways, there’s no point in making goals if you aren’t going to assess them at the end of the time period, so here goes. 1) By the end of the month I want to be running 3 miles every time I go out. That didn’t happen, mostly because at the beginning of the month I totally slacked so I had to create a tight schedule that required not missing a single run to hit the goal, and required running every other night instead of 3 nights a week. I missed a couple of nights, resulting in not running 3 miles a night by the last week of October. I’m OK with the reasons I missed my goal runs though. One night I just ran a mile because the top of my feet had been hurting and I didn’t want to push it. I haven’t really tried to increase my distance since running barefoot and I also haven’t really run all that consistently so this was a big change for me. Another night I went for a walk with my sister’s 2 year old twins and held one or the other while racing to and from light posts, when I got back I was more tired than after a longer run! What did happen is I ran at least 3 times a week without fail and I got up to 2.75 miles so I”ll be running 3 miles a night this week. Good enough for me! 2) Check my mail at least 3 times a week, then look and see what’s in it. 3) I’m getting myself out on the paddle board at least once this month. Nope. I used to be able to take off from my uncle’s back yard and I’d go by myself. Since he moved I don’t have anywhere safe to go paddling by myself so not only do I have to get myself out there I have to get someone to kayak with me because I have no interest in being one of those why would someone do THAT news stories. 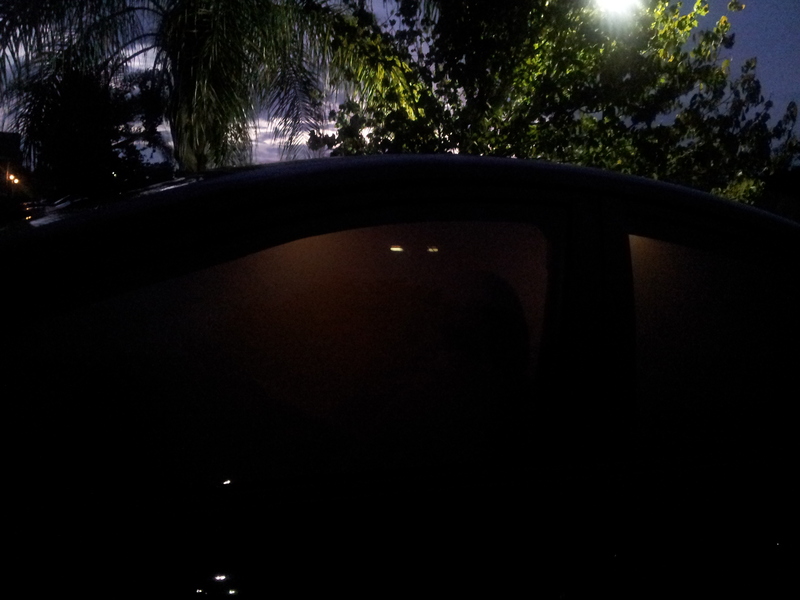 Plus getting that board on top of the car (even if it is a little Prius) is hellacious after paddling a couple hours. I’m pretty sure it doubles it’s weight on the way home! That wouldn’t be such a bad thing except I have so much (fun stuff) going on in November there’s no way I’ll have a chance to get out paddling. Maybe December? 4) At the end of this month I’m setting a new running goal for next month. 1) My running goal is pretty light this month. I simply want to keep running at least 3 times a week and get up to 3.5 miles. This is because I need to start working out again, I don’t even remember the last time I did and the scale is showing it. If I increase my running AND start doing other workouts I’ll be less likely to hit any goals! 2) Those other workouts – core and arm workouts 3 times a week. I’m in the worst shape I’ve been in since I remember, time to get a little strength back. I have 3 obstacle runs in the next 6 weeks, I better get ready to get over those walls and up those ropes now! 3) Cook my lunches to bring to work all week. When I don’t get my lunches ready for the week on Sunday I end up buying it at some fast food place. Bad for my health and bad for my wallet! 4) Running drills and watching my form – I’ve decided to start checking in on the way I run more often, and also start doing some running drills. That way when I’m ready to start increasing my mileage a bit more my body will be more ready for it. That’s the theory anyways.